Do NOT miss out on your chance to own a FURNISHED home in the highly sought after community of St Tropez! This beautiful END/CORNER unit features 2 bedrooms & 2 full baths in 1,033 square feet. Follow the tranquil greenbelt walk way to your front door. As you enter into the dual entry foyer you'll immediately notice the lovely ceramic tile & carpeted floors & neutral custom paint. Your stairway will take to you to your light & bright family room complete with cozy fireplace, flat screen TV, ceiling fan, plush carpet, custom paint & custom window coverings. Adjoining the family room is your gorgeous gourmet kitchen featuring contemporary bright white cabinetry, tile counter tops, all stainless steel appliances (fridge included!) & ceramic flooring. 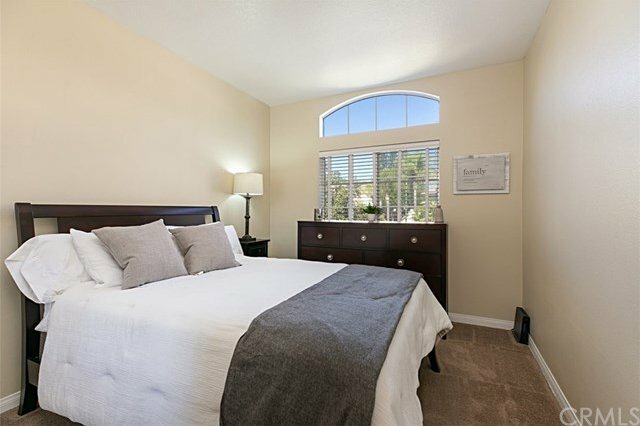 Retire to your large master bedroom complete w/double wide mirrored closet, ceiling fan, open windows, plush carpet & custom paint. Your master bath features dual basin vanity, bright white cabinetry, tiled counter tops, brushed nickel fixtures. A sizeable secondary bedroom w/mirrored closet, open windows, custom paint & plush carpeting. Guest full bathroom with bright white cabinetry, tile counter tops & floors, & brushed nickel fixtures. In unit laundry (washer/dryer included!). Entertain friends in your lovely balcony, large enough for a patio table, chairs & BBQ. Attached/direct entry 1 car garage with built in cabinetry and storage! Community features pool, spa and lovely grounds. Zoned schools are all 8's & 9's rated!